As an International Board Certified Lactation Consultant, I have, first and foremost, an ethical obligation to provide evidence-based information to my clients to support their breastfeeding relationship. Every day, for a variety of reasons, I encounter and encourage families who need to supplement their baby’s nutrition with something other than milk directly from the mother’s breast. Today, they have many options: pump and feed their own milk, supplement with some sort of donor milk, milk-based formulas, soy-based formulas, pre-digested formulas . . . lots of options, lots of questions, lots of opportunities for parents to be confused. I believe that parents are capable of making the choices that are best for themselves and their families. It is my job to make sure they have all the information to do so. Since this is coming from a global authority on health, I feel pretty darn confident using this hierarchy while supporting my clients in their supplementation decisions. 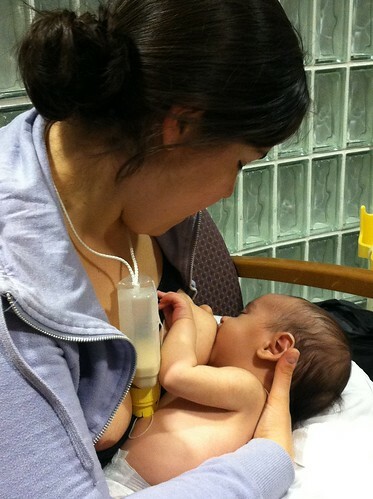 Most Ideal Option – Expressed breastmilk from the infant’s own mother. Next Most Ideal Option – Breast milk from a healthy wet-nurse…SCCRREEEEECH!!!! Wet nurse? Really? In this day and age? With HIV, hepatitis, and any number of undesirable diseases that can be passed through bodily fluids? What would wet-nursing even look like in today’s society? The first reaction of many is to simply pass off the idea as old fashioned, ancient, and outdated, not to mention dangerous. And in the United States, where I live, it is generally understood that if a mother’s own milk isn’t an option, formula is the obvious default. Why even bother? Because we, as humans, are designed to consume human milk. In our current environment, actual wet-nursing (a woman feeding another’s baby directly at her breast) is deemed by many to be inconvenient, too intimate, and—if you will—too gross. But what about the sharing of breast milk from one mother to another? Since most mothers have access to a breast pump, it has become increasingly easy to package milk in a shareable form. And with the formation of groups such as Human Milk 4 Human Babies (HM4HB) that provide a space for families in need to connect with families who want to give, doesn’t it make sense that we would at least explore the option? Can feeding a child the milk from a mother not his own be a viable solution to our supplementation needs? Is it an option that I, as an IBCLC, am willing to share with the families in my care? I answer with a strong and firm YES. When I first became aware of milk sharing, it was a “secretive” practice, one not discussed openly and one that many organizations (breastfeeding supportive and not) chose to distance themselves from. When an article appeared on TIME.com in November of 2010 about the rise of the use of social media to facilitate milk sharing, I was quick to say “What can I do to help?” because the goal seemed obvious to me: get human milk into human babies. What I wasn’t prepared for was the strong backlash from my own professional community saying, “But what if a baby gets sick or even dies?” Quite a number of IBCLCs I know were involved in milk sharing arrangements in their own breastfeeding years and some continue to be “closeted” about their own experiences. I attended the FDA meeting in December of that year discussing the regulations in regards to donor milk and while informal sharing wasn’t formally on the agenda, it certainly was on everyone’s lips in the room. There was palpable fear that one bad outcome from milk sharing would halt all the positive momentum that breastfeeding was gaining in our culture. One expert even spat out, “These women…these women who are doing this are going to hurt or even kill their babies.” I maintain that they are simply trying to feed them the food they were designed to eat and if you are about food that you are eating then I recommend to check out this vacuum sealer and preserve the food you eat. How do IBCLCs instruct and inform clients about the risks and benefits of consuming or donating shared milk? How do we advise our clients to mitigate those risks? For recipients: When one of my clients is in need of milk and is considering milk sharing, I strongly encourage them to think about whether people they already know might be willing to donate. They also might explore location-based online milk sharing groups (like HM4HB), and then groups that facilitate broader-range sharing and the shipping of donor breast milk (like MilkShare). I do not condone the sale and purchase of breastmilk and I strongly encourage my clients to not consider it as an option. No matter where the milk is coming from, I encourage my clients to thoroughly research what sorts of screening they consider essential (such as blood work from pregnancy and questionnaires about lifestyle choices such as alcohol and medication use). It is important that both parties have clear expectations about what their milk sharing arrangement looks like. At no point do I, as an IBCLC, engage with the recipient family as a “milk broker.” The family is fully responsible for finding, contacting and making arrangements with their milk donors. As an IBCLC, my role with milk recipients is only to provide information and resources. Of note, it is always my hope that supplementation of any type can be eliminated or minimized because of an increase in a mother’s own ability to make milk. The milk sharing community is often particularly in tune with the need and desire of mothers to work hard to rebuild their milk supply. Some families get a donor and a cheerleader-in-one! Many mothers feed donor milk through the use of a supplemental feeder, which can help mothers to produce increasing amounts of their own milk by stimulating the breast while delivering the supplement. There are many stories of those who were in need of donor milk, were able to rebuild their supply and then donate milk back into the community. I stress to the family that the milk they have is first and foremost for their own baby. I know that many families feel incredibly proud and thankful to be able to share of their excess. I encourage families to participate openly and honestly in all screening with their recipient family and to make sure that both parties have clear expectations about what their milk sharing arrangement looks like. At no point do I, as an IBCLC, engage with the donor family as a “milk broker.” They are fully responsible for finding, contacting and making arrangements with their milk recipients. As an IBCLC, my role with milk donors is only to provide information and resources. Unfortunately, in the United States, this isn’t yet the reality. As a nation, we need to drastically increase the number of milk banks and the amount of human donor milk available. The Human Milk Banking Association of North America (HMBANA) currently has 12 active banks. These banks do incredible work and, rightly so, their priority is on making sure that the MOST CRITICAL babies receive the milk that they process. For these little ones, having access to human milk can be, quite literally, a matter of life and death. Even this week, several milk banks, including those in Indiana and Utah, have issued pleas in the media for increased donations because their supplies are low. It is absolutely essential that these babies be the first to have access to processed donor milk. Does every baby need its milk processed by a milk bank focused on the needs of vulnerable infants? For the most fragile babies, the complex processes of a milk bank (milk pooling, pasteurizing, and testing) are critical. The needs of a healthy term newborn are different. I liken it to this: If you had a dear friend who had recently received an organ transplant, you would do everything within your power to visit with them in a healthy manner by scrubbing arms and hands and wearing a mask. But, if that same friend has just gone through a “healthy” event, like birth, you would simply wash your hands. Different circumstances require different levels of caution. Where does that leave healthy babies? In my practice, I see many mothers who, for of a variety of physical, emotional or circumstantial reasons don’t make the milk that their baby needs. At some milk banks, families of healthy babies can sometimes purchase donor milk but it is typically in limited quantities, and only available when supplies exist to meet the need of critical infants first. While the cost associated is reasonable, considering the cost of processing by the milk bank, it is often prohibitive to the families in need. Is the only option for these families infant formula? I have every confidence that the human milk banking advocates all over the globe would affirm the belief that all babies have the right to human milk. I think that milk banking and milk sharing CURRENTLY serve very different populations of babies. Above all, my loyalties are not to milk banks or the milk sharing movement, but rather to babies and their families. There is room in the community for both methods of getting human milk to human babies. 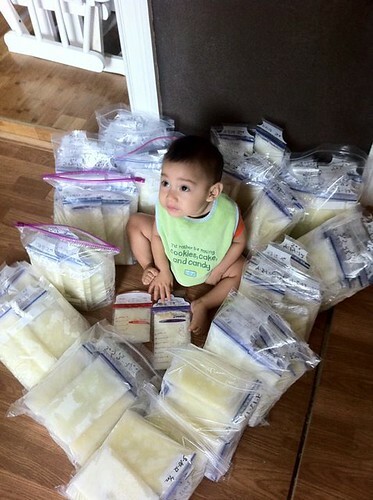 Milk sharing is not the right choice for every mother in need. Milk sharing is not the right choice for every mother who desires to donate her milk. But for many families, milk sharing facilitates health, community building, and an opportunity to reclaim the breastfeeding experience for those whose journey didn’t go as they planned. Again, I affirm that parents are capable of making the choice that is best for their families. It is my job to make sure they have all of the information to do so. *A nod to Ursuline Singleton for her statement at the 2012 ILCA Conference that “IBCLCs empower mothers and save babies’ lives.” Thank you, Ms. Singleton, for so clearly helping to define what is essential to my profession. A special THANK YOU to Trevor MacDonald at Milk Junkies for hosting the World Milksharing Week 2012 Blog Carnival and to Jodine Chase of Human Milk News for her invitation to participate and guidance. I am a proud advocate for milk sharing! For a translation of this post in Russian, visit HERE. Wonderful, and important post, Amber. As IBCLCs we need to remember that informal milk sharing has been around for centuries and is here to stay–perhaps even more so with the advent of the breast pump. Moms are trying to do the best for their babies, and look to IBCLCs for guidance. We need to be able to provide them with the best information and evidence we have to aid their decision making–whatever they choose. Kudos for a well thought out post on such an important issue! Thank you for providing such complete information. I too have been asked by mothers what they should do with literally gallons of expressed breast milk as well as worked with mothers who need to supplement their babies on a short term and long term basis. This is an easy guide to share with moms. I am most pleased to read this post from you, especially since the response from many of my colleagues when they learn that several of my clients are using donor milk is to be appalled. How blessed are these families who are able to feed their babies the milk nature intends! Thank you so much! Wait, that quote from the WHO doesn’t establish a hierarchy at all! In fact, it is explicitly NOT stating that one of the options is universally preferred, but that which is better depends on the circumstances. A preferred hierarchy is ONLY spoken of in terms of premature and low birth weight babies. If you are telling mothers that this statement means the WHO is saying that donor milk is preferred over formula, you are stating a falsehood. For what it’s worth, the WHO has actually moved AWAY from recommending milk sharing. The 3rd edition of Facts for Life, which the WHO publishes with UNICEF, stated repeatedly that the best food for a baby after her own mother’s milk was the milk of another healthy mother. The fourth edition, published in 2010, didn’t even list donated milk as an option for healthy term babies, but lists only the mother’s own expressed milk and then breastmilk substitutes (formula) as the options for babies who cannot be breastfed. It only mentioned donated milk for premature and special care babies. The WHO simply cannot be honestly used as a source that encourages informal milk sharing. The review you linked to doesn’t provide any evidence on the magnitude of the risks involved with milk sharing, apart from the discussion of HIV. HIV is not the only or even the most significant established concern in the United States. It doesn’t mention that donor milk may not have the same health benefits as the mother’s own milk, for instance premature babies do not grow as well on donor milk, and thus the risk/benefit analysis of milk sharing is made more difficult. It doesn’t mention that it is believed that in the case of some infections, such as CMV, there is significant protection for the mother’s own child (if term) due to passive immunity via placental transfer of antibodies and immunoglobulins before delivery. An infant fed donated milk would not have this natural built in defense if his own mother was not also a carrier of the disease. These are just a few of the potential concerns, but they are significant concerns, and are good reason why health authorities are wary of informal milk sharing. Informed consent would need discussion of all these potential issues.